Aussie left over 15 years ago to start a life in Australia (hence the nickname) since he married a real Aussie girl. Hence, we haven't connected as often as we would've liked due to distance. However, whenever he is in town, we make it a priority to meet up. Last year, it was with the whole family, but this time around he made a trip out to Lotusland since he was in between jobs. 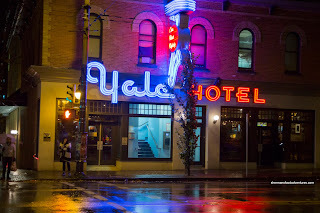 Back in University, we had ferocious appetites which would potentially bankrupt many buffets, so we decided to hit up the newly renovated Yale Saloon for some meat action. You see, they have become a BBQ restaurant (get your head out of the gutter...). But before we attacked the meats, we got a bunch of appies to go with our brews. We sampled the Deep Fried Pickles first and sadly, the tempura batter on the outside was a fail my opinion. It was somewhat doughy and not nearly crispy enough. They would've done better using breading or panko instead. As for the pickle itself, it was juicy and appealingly salty/tangy. 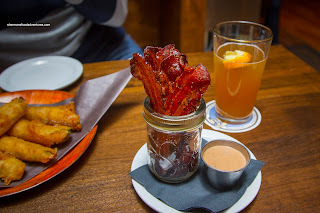 Everything was all and well when we dug into the Candied Bacon as each strip was meaty and just sweet enough. The stickiness of the exterior didn't degrade the texture of the bacon much. I felt that it didn't even need the accompanying dip. 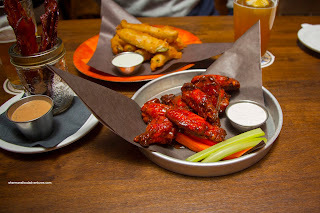 With the urging of our waitress, we also got the Chipotle Smoked Chicken Wings. Unlike their appearance, the wings were not particularly spicy, rather, the smokiness really came through. Despite the tendency of smoked chicken being dry, these were not overly so. In fact, there was some succulence left while sporting rendered skin. 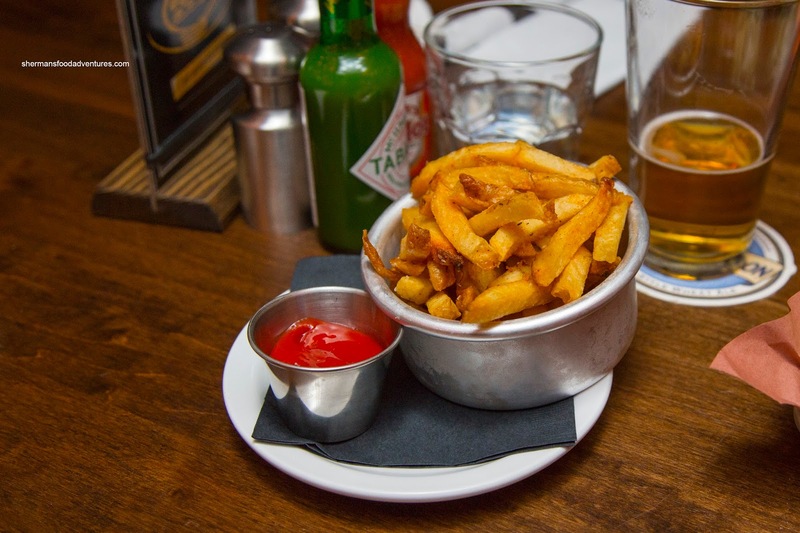 Since I absolutely love fries, it was a given that a side of Fries was to be included in our order. 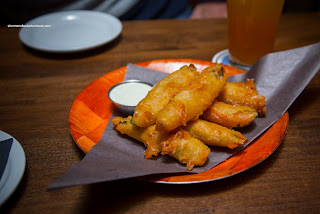 These were on point being the Kennebec variety and double-fried. Hence, they were aggressively crispy while retaining some potato texture. 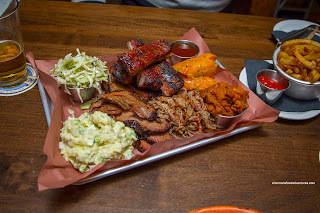 Onto the main event, we shared the Sampler Plate consisting of Brisket, Side Ribs, Pulled Pork, Potato Salad, Coleslaw, Jalapeno Corn Bread and Baked Beans. Due to the cut of brisket, we found it somewhat dry, but still appealingly smoky with a tasty bark. The ribs were really good being smoky with a good char while tender and not dry. Retaining some moisture and mildly sauce, the tender pulled pork was respectable. Sweet, but balanced with some spice, the corn bread was super moist. As for the sides, the potato salad was eggy and mild tasting. The coleslaw was crunchy and in need of some acidity while the baked beans were somewhat sweet with nuggets of meat nestled within. As for the BBQ sauce, it was slightly thin and vinegary with a touch of sweetness. Now if you can believe it or not, only half a piece of brisket remained after we were done. I guess we didn't completely lose our touch after all these years.